Often our customers just need a simple issue sorting out and to assist with this we are happy to offer the benefit of our experience to help. In many cases simple issues can be sorted out over the phone or via a remote support session, which is where software installed on your local computer will allow us to log into it remotely and attempt to fix the issue. This is often much faster than physically coming out to your home or business and as such we are able to offer this service at a lower cost than the equivalent call out. Please be aware that not all issues can be tackled in this way, any Internet connection issues will rule this approach out completely. 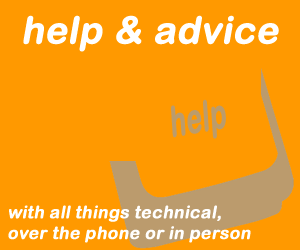 Computers and websites are not the only things we are able to offer help and assistance with, if you would like to know about audio visual installations for conferencing or a home cinema system we will be able to help in those areas also, or if you need ongoing help check out our other services such as computer user training Sutton Coldfield. We manage to retain a great deal of customers due to our friendly approach, fair pricing and excellent work and these customers are welcome to call up for free assistance to simple issues whenever they arise.